Courtesy photo The Pokagon Band of the Potawatomi Indians is building a Four Winds Casino in South Bend. INDIANAPOLIS – The state's newest casino could turn the industry on its head and cost the state millions in tax revenue. 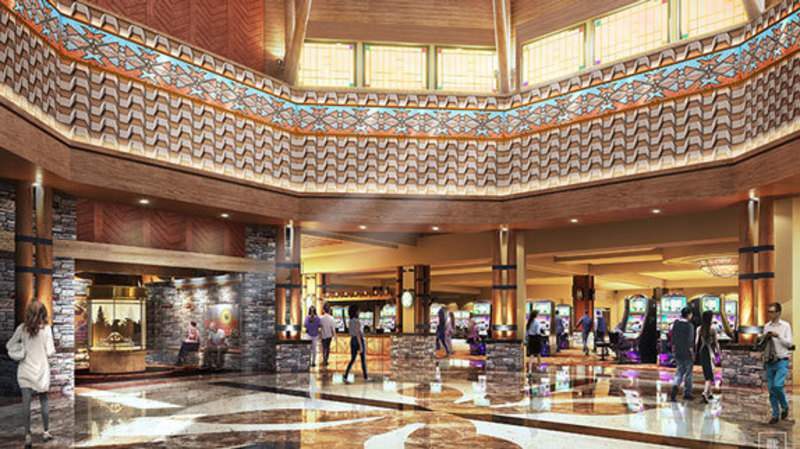 The Four Winds Casino in South Bend – run by the Pokagon Band of Potawatomi Indians – is Indiana's first tribal casino, and doesn't have to pay gambling-related taxes or follow gaming laws imposed on other facilities. The freedom comes with federal protections given to Indians by Congress in the 1990s. “They are good operators. They would be a rival with a level playing field, but the field is not level,” said Matt Bell, executive director of the Casino Association of Indiana. The first phase of Four Winds Casino South Bend will employ about 1,200 people and have 175,000 square feet of space – making it the largest gambling facility in Indiana. It will feature about 1,800 slot machines and 4,500 parking spaces. The band operates Four Winds casinos in New Buffalo, Hartford and Dowagiac, Michigan. Along with the 55,000-square feet of gambling space, the Sound Bend Four Winds will feature a steakhouse, buffet, grill, players' lounge and three bars. It is expected to open in early 2018. “We expect to draw from most communities within a two-hour drive, including Fort Wayne and Indianapolis,” said Paige Risser, director of communications for the tribe. The northern Indiana casinos – specifically Blue Chip in Michigan City – will feel the brunt of the competition. Bell explained that without paying admissions and wagering taxes, the Four Winds casino will operate with lower overhead. Right now, casinos pay a per head tax every time someone enters a casino, as well as a tax on the overall level of wagering at a casino. That marketing will no doubt shift gamblers from existing casinos to the new one in South Bend. Bell's association last year completed a study analyzing the impact the casino will have on the industry. That study found the state could lose $355 million in revenue. This is largely through gaming taxes as consumers move to the Four Winds casino. The industry could also lose 730 jobs at other gaming facilities. One thing the new casino won't have is table games. In 1998, Congress gave tribes authority over Class II games, such as bingo-style games and some slot-like gambling devices. “The simplest way to put it is that the math behind determining the outcome of a Class II game is different than with slot machines,” said Sara Gonso Tait, of the Indiana Gaming Commission. Federal law requires the tribe have a compact, or agreement, with states for Las Vegas-style Class III games, such as table games. “The Pokagon Band has not requested compact negotiations with Indiana at this time; it is focusing on Four Winds South Bend and its current offerings,” Risser said. Tait said Indiana casinos are an important revenue source to the state and how they can remain competitive with the growth of gambling in neighboring states, and now the Pokagon Band in Indiana, has been a topic of conversation for many years. “We do not, however, know the real impacts at this time,” she said. Gov. Eric Holcomb's office has hired a Detroit law firm specializing in tribal casino law. The $200,000 contract with Dykema Gossett runs from July through June 2018. The contract is not limited to compact negotiations. The governor's staff said the state is interacting with the Pokagon Band on a government-to-government basis. Examples of issues requiring the state and the tribe to work together include public safety, taxation of nongaming activities, utilities and environmental concerns. If the state ever moves to compact negotiations one difficulty is that Indiana already has a mature gambling industry and doesn't have a lot to offer in exchange for revenue and regulatory authority. Bell said lawmakers did some good things in a bill last year, including a move away from the per head admissions tax that will ultimately reduce casinos' tax obligations to the state. No other tribe has been granted land trust status in Indiana – the precursor for a tribal casino.